Discussion in 'Guitars in General' started by WoodenDuckMaker, May 1, 2016. I'm sure those of you who sell guitars on Craigslist that are worth more than $500 get the same scammers using the same hustle. They give you a story about why they can't pay cash, and offer a check that's over your asking price, as a token of their generosity. You cash it, it ends up being bogus, and your liable for it. $1,700 for my $600 item. What an angel! For sh*t's and giggles, when I was withdrawing money at the bank, I showed it to the cashier. She held it up to the light, and said there is a watermark. She asked to see the stub, I told her that's all there was. I pointed out how the check was regular thin and flimsy printer paper. We both giggled and agreed the check sucked, and I left. What should I text the scammer now? Tell him I received it and will be depositing it on Monday? KeLynne, Silver Hand, Scrapperz and 3 others like this. 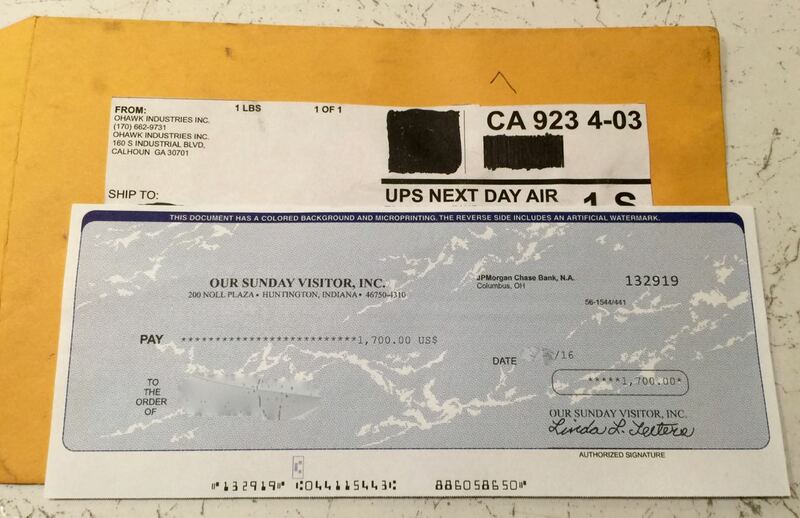 If you gave them a fake address how did you receive the check? lespaulreedsmith, Killed_by_Death and MrLahey like this. If you gave them a fake address how did you receive check? A friends rental house that they have moved out of, but still have a couple weeks left on their lease. The way the scam works is they have no interest in your guitar, they just want you to send them some of the excess money back, usually by money order. Tell them it's on its way. Keef Wichards, Sir Nicholas, Scrapperz and 2 others like this. Send them something that makes them not want to scam people anymore. My imagination isn't working right now but I bet you can think of something. Silver Hand, WoodenDuckMaker and NamaEnsou like this. Send them something that makes them not want to scam people anymore. My imagination isn't working right now but I be you can think of something. Slevin, aussie_owner, RYAN1987M and 3 others like this. My dad has half a dozen of these fake bank checks. He enjoys messing with scammers. Silver Hand, Brian N, BacchusPlateau and 3 others like this. Tell them thats what the bank gave you in exchange for the check. eldorado2001, Digidog, BadHat and 30 others like this. I use to get the response of, " I will have my movers come to your house, with a cashiers check". It's such a tired and played out scam it's hard to imagine anyone falling for it. Yet, they're still doing it because it still works. Sir Nicholas, bloomz and NamaEnsou like this. i have come across this before, We discovered that the company info and account number were for a real entity whose info was stolen. We looked them up and let them know, they were able to close accounts and act accordingly. Silver Hand, jrjones and NamaEnsou like this. Is it legal to mail $hit? flume and Lt Dak like this. I think this is felony mail fraud on top of many things. Hard to track these people down. Silver Hand and SPROING! like this. That was the first thing I thought of, but probably not. Draw a check, made by you in paper, with crayons. Send it back, i am sure that will piss the hell out of them when they finally open the envelope. flume, aussie_owner, RYAN1987M and 10 others like this. Why waste your time? Sure, they invested some of their stolen money in sending the fake MO, but do you actually think the scammers care? Jim Holloway and Paleolith54 like this. Wondering what the best way to report them is. To someone who might actually take action. This is hilarious...except for the people moving into that rental house. You may not know them, but this game you're playing may put them in danger. Jabberwocky, NamaEnsou, chrisjw5 and 1 other person like this. Rub a dollar with poison ivy and send it to them. keepingitweird, BK Verbs, Ben Furman and 6 others like this.